WCS conducts the annual Adirondack Loon Census across northern New York State. Our loon census regularly engages 500-600 volunteers who scout loons on more than 200 lakes. Despite an apparently stable or increasing population, loons face a variety of threats in the region. 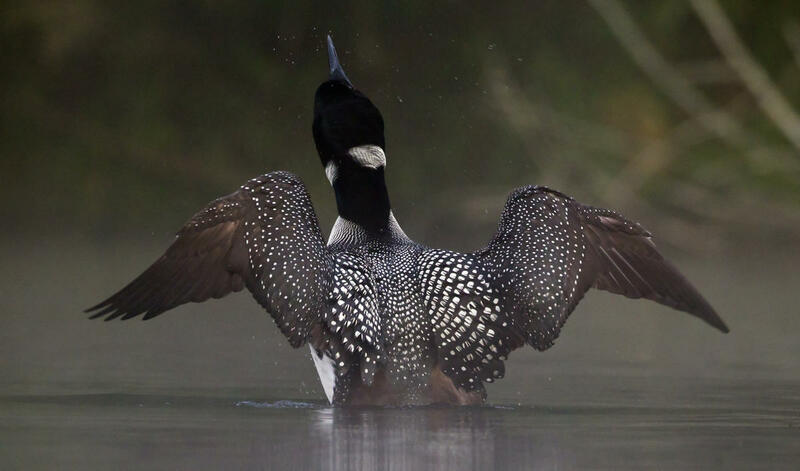 The most comprehensive research has been conducted around mercury, a common environmental pollutant and potent neurotoxin, which has resulted in reduced loon reproduction in the Adirondacks and elsewhere. Other known threats to Adirondack loons include, but are not limited to, habitat loss from shoreline development, human recreational disturbance, fishing line entanglement, lead toxicity from ingestion of lead sinkers, and wintering ground hazards such as oil spills. WCS aims to find innovative solutions to the problems facing loons and prevent population decline. The Adirondack Park is the heart of the breeding loon population in the state; the current summer loon population for the Adirondacks is estimated at 600-850 pairs. Research suggests that the loon population has been gradually increasing in size and expanding its range in the region, but overall productivity appears to have slowed. This could indicate that the population may be near carrying capacity, meaning the greatest number of loons our lakes could be expected to hold. WCS conducts the annual Adirondack Loon Census across northern New York State (noted above). Held each July since 2001, in conjunction with other censuses across the northeast, our loon census regularly engages 500-600 volunteers who scout loons on more than 200 lakes. This glimpse of the annual status of the breeding loon population is critical to guiding management decisions and policies that affect loons.